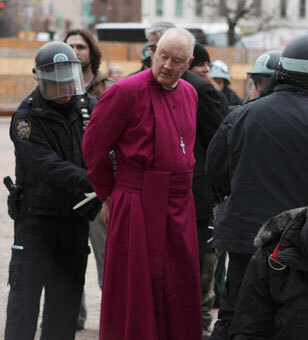 Bishop Packard is arrested on May 1. After reading the dispiriting news that Bernard Law is still making vicious mischief in Rome (he was largely behind the Vatican's current attack on American nuns), I was very glad to read of the exploits of retired Episcopal bishop George Packard (at left), who was arrested during the May 1 Occupy demonstrations, as he and 15 other veterans (Bishop Packard fought in Vietnam) linked arms in an attempt to hold the Vietnam Veterans Memorial Plaza against a sweep of armed police. This was actually Packard's second arrest at an Occupy demonstration. Last December 17 he was arrested when he hopped a fence (in his bishop's robes) in an attempt to spearhead the occupation of a lot owned by the Episcopal Church, following the forced evacuation of Zuccotti Park. The spirit is calling us now into the streets, calling us to reject the old institutional orders. There is no going back. You can't sit anymore in churches listening to stodgy liturgies. They put you to sleep. Most of these churches are museums with floorshows. They are a caricature of what Jesus intended. Jesus would be turning over the money-changing tables in their vestibules. Those in the church may be good-hearted and even well-meaning, but they are ignoring the urgent, beckoning call to engage with the world . . .
''Occupy is a political movement. Let's not be naive. But it also has a moral core. We are in the midst of a reawakening of a spiritual anthropology. All of the groups that have risen up, across the globe, have this reawakening. Those who took to the streets in the Middle East were not simply unsettled. They were called together because they had a connection with each other. Many, many people have reached a point where the only option left is to place their bodies, their beings, in a location where they can finally have some say and some control over their own lives. As Carne Ross points out in his book The Leaderless Revolution, people have lost their agency; they have lost control of their lives. The only control many have left is the control of their physical being. They place themselves in locations where they can demonstrate that they no longer support current systems of power. If you don't have any money in our political system you not only have no say, you don't have any dignity. And the only way left to reclaim our dignity is to occupy, to reinhabit the environments that have been taken away from us. For more from Bishop Packard, including a wrenchingly honest discussion of how he came to terms psychologically with the killings that won him a Silver Star and two Bronze Stars in Vietnam, check out www.truth-out.org. An honest Christian. Almost restores my faith in human nature. He'd get my vote. Hard to believe a few Christians actually take the whole thing seriously, isn't it. Bishop Packard definitely rocks, and he's absolutely right: Jesus would have been in Zuccotti Park.